As a family medicine resident, I have the opportunity to care for the poor and underinsured within a supervised environment. I learn to complete the insurance paperwork, disability evaluations, electronic documentation, and refill requests usually handled by other members of an outpatient practice team. Also, at McLeod I work in an efficient, quality-driven inpatient system. It is no surprise why many of my resident colleagues choose hospital medicine. Yet, I am planning a career in person-centered outpatient care. Because of a trial experience of integrated behavioral care with a psychology graduate student from Francis Marion University, I have a renewed vision for what this career could be. Over the course of approximately four months, I had available collaboration – by text or phone call – with an in-house behavioral health consultant John Schwartz, MS. While his office was on the other side of the clinic, he was usually available within a few minutes and would either join me in the clinic room with the patient or meet me outside of the room and then go join the patient. 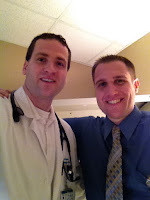 At least 25 patients had the experience of seeing both of us within one clinic visit. Together, I was able to commit my first patient with suicidal tendencies and coordinate resources for my first child with autism; provide training on parenting, coping with grief, pain management, sleep hygiene, relaxation techniques, alcohol and smoking cessation; and coach patients on communication skills. Additionally, several patients returned for follow-up appointments with Mr. Schwartz. Because of administrative and payment barriers, it is unlikely that psychology students will continue to be a part of my residency experience. Nevertheless, learning and serving together with John Schwartz has been an honor and an encouragement to my future career in outpatient medicine. I want to collaborate with a behavioral health consultant, not just refer or co-locate. I hope that other residents have a similar experience before they decline the opportunity of outpatient practice. For more information on South Carolina Family Medicine Residency Training Programs or to Contact Dr. Hoyle, please contact Kristin Cochran at cochrak@musc.edu.